The children need erasers! And air conditioning! And teachers! The children can’t just sit there and be expected to discover how multiplication and division work. Fundraising for K-12 schools isn’t calculus. While fundraising, in general, may require some serious thinking, raising money for schools is simple math, and something that your school can and should do in order to have the funds to offer the best opportunities. Educational institutions need to raise money for various expenses, such as student clubs, community projects, facility updates, and more. K-12 schools receive local, state, and federal funds, but they tend to need more money in order to operate at full capacity. As nonprofits, raising money through charitable donations from parents, alumni, and community members is a great way for schools to accrue more revenue. For the same reason you go to work. They need money to pay the bills. Schools have to cover the cost of teacher salaries, field trips, educational resources, and more. 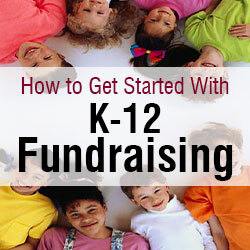 K-12 schools can even emulate colleges and fundraise on behalf of charities. Many K-12 schools have clubs that support local or national causes. These clubs run fundraisers on behalf of their respective nonprofits. Using a school to fundraise is a great way for nonprofits to make their needs known to entire communities at a time. How do K-12 schools fundraise? Fundraisers – Teachers, administrators, and students are your go-to people for organizing and executing fundraisers. Parents and community members can also help. Donors – Parents are the most common donors, but school staff and members of the community can also give. Just don’t ask your students to fork over their lunch money. Crafting fundraising events requires knowing your people. What fundraisers do the students want to run? Would parents be more giving if you ran events geared towards them, such as wine tastings? How much time and energy does your school’s staff want to dedicate to fundraising? Asking for donations is the usual nonprofit method of raising money. If your school is going to request gifts, then it helps to use prospect research to learn important facts about parents that can help to make fundraising appeals more personal and more effective. However, schools have the luxury of being able to get creative with fundraising. There is a plethora of events that schools can run in order to raise funds for big events like prom, homecoming, and student trips. Penny war – Kids might not get naturally excited about fundraising. To encourage more enthusiasm, you can try an interesting, competitive fundraiser. Penny wars challenge students to bring in loose change. You can get tricky with the rules, but the goal is to make it a fun competition that helps your school raise money from spare change that might have otherwise been left lying around. Bake sale – While parents can obviously get involved by donating, you can build some goodwill by encouraging parents to help out and feel like they’re doing more for the cause. Bake sales are a chance for parents to work with their kids to cook delicious treats. Parents can also help to organize and promote bake sales, as well as oversee the sales. A big perk of getting parents involved as participants, rather than just donors, is that they might tell their friends that they’re part of a bake sale, which could mean that new people come and support your school. School sleepover – Parents love their kids, but they could always use a night off. Many parents will gladly pay for their kids to sleep at the school. This benefits the kids, too, as they receive a night full of games and snacks with their buddies. Make sure that your school has teachers and administrators willing to help out, as the burden of playing ‘babysitter’ often falls upon them. The secret weapon of K-12 fundraising is the ability to host events that involve students, parents, and larger communities. Schools can have plenty of fun while raising funds, and there is an endless variety of fundraising events from which they can choose. Once you’ve selected and hosted some fundraisers, learn how to make the grade with your events by testing their performance using success metrics! Students in grades K-12 need great resources in order to learn. Don’t wait for the future. Kids are the future, and they need great schools now. Roy is the Vice President of Marketing at DonorPro, an innovative software company that helps nonprofits grow their fundraising revenue by an average of 37 percent each year. Roy has extensive experience consulting in higher education and leading fundraising efforts for military veteran causes. He is also a regular speaker at nonprofit technology conferences and a public voice for Veterans in the Pittsburgh area.